Organised by Crosby Granger Architects on behalf of Copeland Borough Council and the Whitehaven Townscape Heritage Initiative (THI), the fair in the town's Market Place attracted around 600 people. "In a town with such an important architectural heritage, it's vital we don't simply let these trades die away. Not only are they important in caring for older buildings, but they are increasingly being found to be more environmentally-friendly and sustainable then modern alternatives." Tim Wells of Eden Lime Mortar said the event had been a success: "I spoke to a builder who tanks houses for a living. He has now seen the light and plans to get training in using lime instead of cement. Some home owners discovered, after chatting with me, that cement was ruining their houses. They now understand how lime works and have some knowledge when talking to their about materials. I would say the day was a success." Chloe Granger of Crosby Granger Architects, said: "Traditional skills shortage is a real issue affecting the sustainable repair of our historic buildings. Keeping those crafts alive is critical, not only as a testament to our past, but also because traditional materials are the only way we can ensure compatibility with existing structures when repairing them. 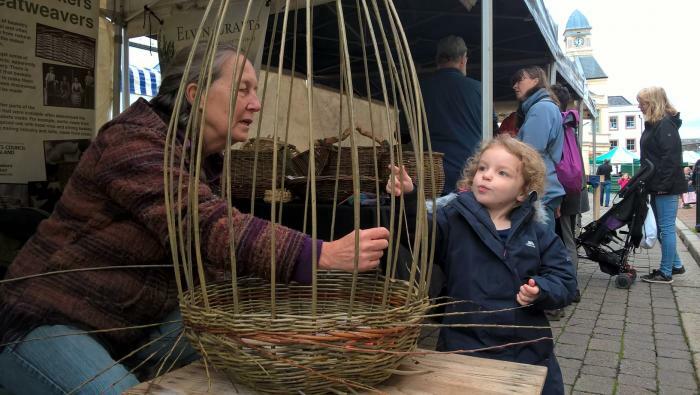 The aim of the fair was to reach out to the public, make them aware of our traditional skills, and show people how best to maintian their traditionally-built homes."